The Sacramento Bee is a daily newspaper published in Sacramento, California, in the United States. Since its founding in 1857, The Bee has become the largest newspaper in Sacramento, the fifth largest newspaper in California, and the 27th largest paper in the U.S. It is distributed in the upper Sacramento Valley, with a total circulation area that spans about 12,000 square miles (31,000 km2): south to Stockton, California, north to the Oregon border, east to Reno, Nevada, and west to the San Francisco Bay Area. The Bee is the flagship of the nationwide McClatchy Company. Its "Scoopy Bee" mascot, created by Walt Disney in 1943, has been used by all three Bee newspapers (Sacramento, Modesto, and Fresno). Under the name The Daily Bee, the first issue of the newspaper was published on February 3, 1857, proudly boasting that "the object of [the Sacramento Bee] is not only independence, but permanence". At this time, the Bee was in competition with the Sacramento Union, a newspaper founded in 1851. Although the Bee soon surpassed the Union in popularity, the Union survived until its closing in 1994, leaving the Sacramento Bee to be the longest-running newspaper in Sacramento's history. The first editor of the Sacramento Bee was John Rollin Ridge, but James McClatchy took over the position by the end of the first week. Also within a week of its creation, the Bee uncovered a state scandal which led to the impeachment of Know-Nothing California State Treasurer Henry Bates. On March 13, 2006, The McClatchy Company announced its agreement to purchase Knight Ridder, the United States' second-largest chain of daily newspapers. The purchase price of $4.5 billion in cash and stock gave McClatchy 32 daily newspapers in 29 markets, with a total circulation of 3.3 million. On February 3, 2007, the paper celebrated its 150th anniversary, and a copy of the original issue was included in every newspaper. On February 4, 2007, a 120-page section was included about the paper's history from its founding to today. 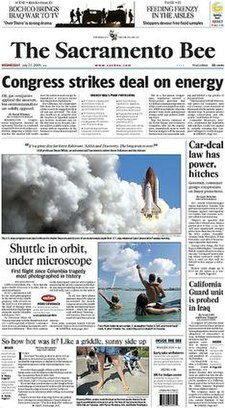 In 2008, the Sacramento Bee redesigned and changed its layout. The Sacramento Bee has won six Pulitzer Prizes in its history. It has won numerous other awards, including many for its progressive public service campaigns promoting free speech (the Bee often criticized government policy, and uncovered many scandals hurting Californians), anti-racism (the Bee supported the Union during the American Civil War and publicly denounced the Ku Klux Klan), worker's rights (the Bee has a strong history of supporting unionization), and environmental protection (leading numerous tree-planting campaigns and fighting against environmental destruction in the Sierra Nevada). In 2003 the Council for Media Integrity from the Committee for Skeptical Inquiry (CSICOP) gave the Candle in the Dark award to Edgar Sanchez for his column "Scam Alert" where he has written about Nigerian scams, car-mileage fraud and phony police detectives. The Council is made up of by scientists, media and academics, all concerned with the "balanced portrayal of science". The Candle in the Dark Award is presented to those who show "outstanding contributions to the public's understanding of science and scientific principles". ^ "Executive Leadership". Sacramento Bee. December 4, 2006. Archived from the original on March 22, 2009. Retrieved December 14, 2009. ^ Alfano, Anthony (January 23, 2016). "The Alfano Group: 20 Things you probably didn't know about The Sacramento Bee newspaper". thealfanogroup.blogspot.com. Retrieved August 5, 2018. ^ "FORM 10‑K". sec.gov. 2017. Retrieved August 5, 2018. ^ "2007 Top 100 Daily Newspapers in the U.S. by Circulation" (PDF). BurrellesLuce. 31 March 2007. Archived from the original (PDF) on June 4, 2007. Retrieved 2007-05-29. ^ "Working at The Sacramento Bee". Glassdoor. Retrieved August 5, 2018. ^ Carolyn Thomas Foreman (September 1936). "Edward W. Bushyhead and John Rollin Ridge, Cherokee Editors in California". Chronicles of Oklahoma. Oklahoma Historical Society. Retrieved October 22, 2010. ^ Richardson, Darcy G. Others: Third-Party Politics from the Nation's Founding to the Rise and Fall of the Greenback-Labor Party. iUniverse: 2004; p. 206. ^ Katharine Q. Seelye and Andrew Ross Sorkin, "Newspaper Chain Agrees to a Sale for $4.5 Billion", The New York Times, March 13, 2006. ^ Seelye, Katharine Q.; Sorkin, Andrew Ross (13 March 2006). "Newspaper Chain Agrees to a Sale for $4.5 Billion". nytimes.com. Retrieved August 5, 2018. ^ "Award-winning coverage that makes a difference". The Sacramento Bee. December 8, 2006. Retrieved April 5, 2011. ^ Nisbet, Matt (1999). "Candle in the Dark and Snuffed Candle Awards". Skeptical Inquirer. 23 (2): 6. ^ Frazier, Kendrick (2004). "From Internet Scams to Urban Legends, Planet (hoa)X to the Bible Code: CSICOP Albuquerque Conference Has Fun Exposing Hoaxes, Myths and Manias". Skeptical Inquirer. 28 (2): 7. ^ "MANOPAUSE: Experts seeking treatments for middle-age male testosterone deficiencies". products.kitsapsun.com. Retrieved August 5, 2018. ^ Pierleoni, Allen (October 27, 2014). "Between the Lines: Spooky tales for Halloween". Retrieved August 5, 2018 – via Sacramento Bee. "The Sacramento Bee". Glassdoor Reviews.